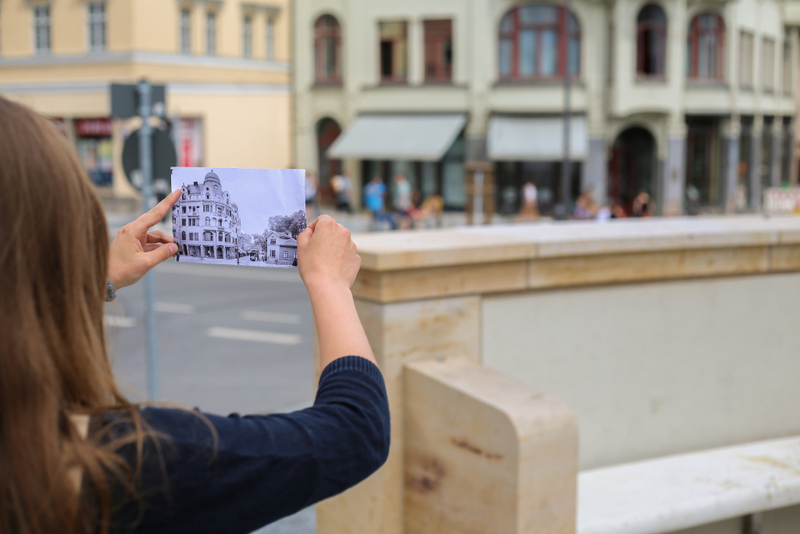 In the educational program 'Time Window Weimar' the Klassik Stiftung Weimar worked with students to develop an app that locates the age of modernity in the urban space through visible evidence and intangible histories, thus revealing to the public Weimar's modern-historical legacy. To present these complex topics and issues, the application uses augmented reality, digitally overlaying historical photographs relating to, for example, forms of mobilisation, above the original sites as seen now. As a result, visitors gain access to relevant information by reading texts and listening to audio files. In addition, the app also provides a multi-dimensional visual approach to history. Weimar – 'Symbol of German Culture'? Weimar, a small city of around 60,000 people in the east of Germany, has played a pivotal role in German and European history. 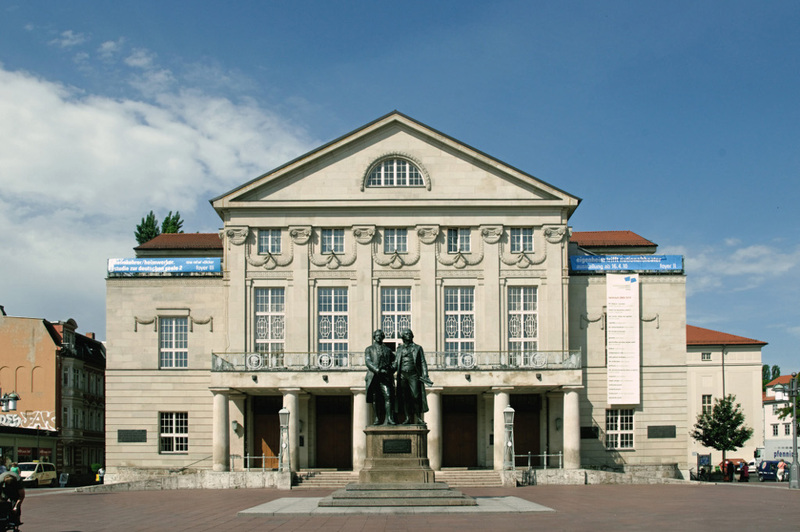 Every year, the city hosts several hundred visiting school classes and half a million tourists, primarily attracted by the sites associated with Weimar Classicism. At the close of the eighteenth century Weimar was home to both Goethe and Schiller. Today's most popular sites include the houses of these two famous writers, as well as the Goethe and Schiller Memorial in front of the German National Theatre. Tour operators often focus exclusively on Weimar Classicism and these sights. However, they overlook how, in the course of the nineteenth century, these same memorial sites and surrounding squares were often instrumentalised for political purposes, and re-inscribed with new ideological significance. Similarly, scant attention is paid to Weimar's particular relevance in early twentieth-century German history. After 1900, Weimar was home to Henry van de Velde, Harry Graf Kessler, and Nietzsche's sister Elizabeth Förster-Nietzsche. Walter Gropius founded the Bauhaus in Weimar. Weimar also played a significant role in German and European history in the context of the Nazi party and Hitler's rise to power. The German National Theatre was the scene of the 1926 Party Rally confirming Hitler's leading role as the head of the NSDAP (the National Socialist party). In 1937 the Buchenwald concentration camp was set up close to the town. Buchenwald was one of the largest concentration camps in Germany, and is now preserved as a memorial site. The period around 1900 was a pivotal point between the nineteenth century – an age informed by the spirit of Goethe and Schiller – and the rise of the Nazi party. As a result, this period is essential for anyone wishing to gain a deeper understanding of modern German history. In spite of this, the fact remains that many tourists and visiting students are not very familiar with this period in the city's history. Why is it that the city of Weimar looms much larger in the public's perception as the home of Weimar Classicism and the flurry of activity associated with it, and much less so as a site with ambivalent connotations in the history of modern Germany? Young people and adults often lack the skills to 'read' urban geographic space, since this form of knowledge and awareness is rarely taught in schools. In many ways, the development of key tourist locations, such as Weimar, is determined by economic interests. This subsequently leads to an aestheticization and museumification of the urban space, disguising the manifold re-inscriptions of the site's significance over time – especially when history and historiography are problematic, as is the case with the Nazi period. The educational project presented here aims to encourage an awareness of these histories in the topographic space mentioned above, and counter the prevailing reading of Weimar's urban space from the perspective of tourism and, by extension, economic considerations. Through its participative approach, the project is designed to have an outreach effect, raising general public awareness all over the town, as well as in tourist zones. The project was presented by the Klassik Stiftung Weimar in cooperation with the German Federal Agency for Civic Education (bpb). In contrast to the nineteenth and twentieth century, our knowledge today is derived far more from images than texts. However, a large number of people lack the requisite skills and visual strategies to understand topographic space. In many respects, such areas of knowledge require different forms of knowledge acquisition than those practiced in cultural education in museums (and other spatially delimited cultural sites such as palaces – with their adjacent parks and gardens – or monastery and temple complexes). Consequently, it seems reasonable to assume that the critical appreciation of objects and architectures, as well as urban spaces cannot solely be understood as a cognitive process, but is, in the widest sense, also sensory and aesthetic in nature. The educational project 'Time Window Weimar' explores the town's 'Topography of Modernity', which deals with the era around 1900 and subsequent developments up to the Nazi period. In the project, students in Weimar created a city tour which is now available for other students and visitors to use. It was also part of the '1914 – War of Ideologies' special exhibition. This exhibition addressed the questions why and how the pre-1914 military build-up was preceded by an ideological and intellectual 'mobilisation'. 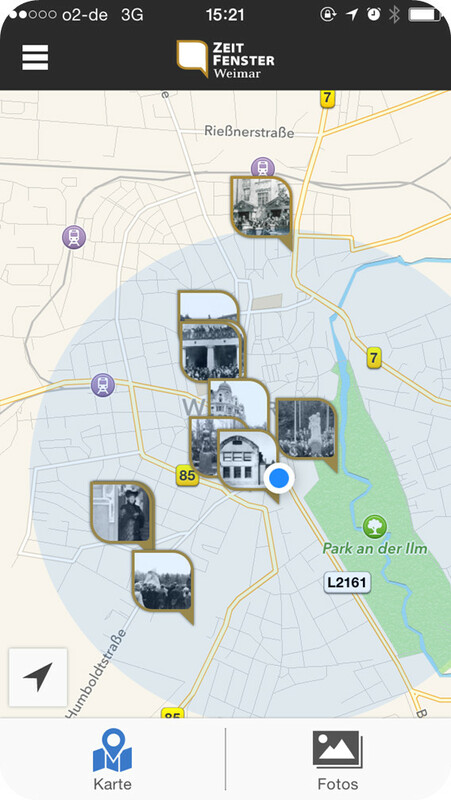 This ideological and intellectual development left many diverse traces in Weimar's urban space, which can now be explored through the Time Window app. The App is available online as a free smartphone and tablet app for iOS and Android (free download via iTunes store or Google play store). 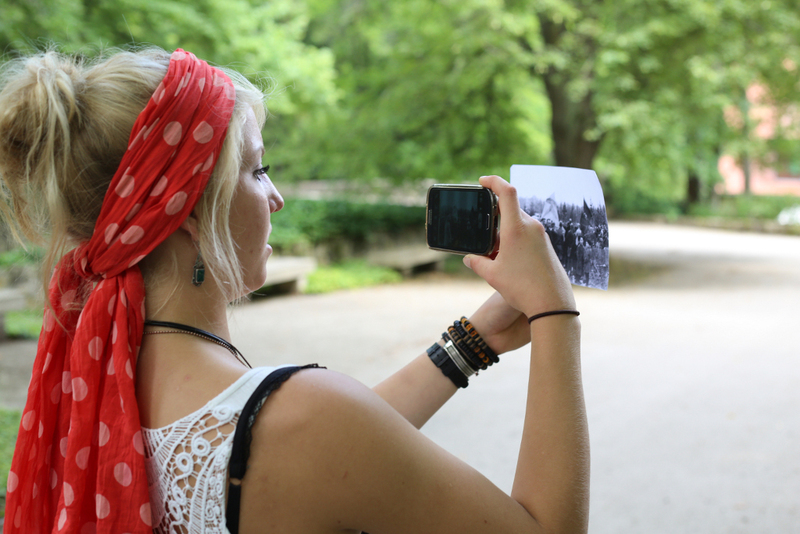 The young people participating in the project gradually learned of the cultural and historical events and developments in Weimar around 1914. In a participative process, they were presented with information which, in the students' view, could be interesting for other Weimar visitors, whether school classes or tourists. They worked with the Time Window app tool, which uses augmented reality to allow the present and past to be experienced visually. Through this, one can view the particular locations and surrounding urban areas in a new way. This technique allows for an aesthetic appropriation of the sites to occur on a visual basis, rather than through the written or spoken word, as in guided tours with either personal guides or audio guides. As a result, the process of understanding begins with sensory perception, as opposed to the cognisance of factual data. By linking the educational project with the exhibition it became feasible, on the one hand, to reach a broad audience and, on the other, to connect the content presented in the exhibition with its wider reflection in the urban space. The app is also designed to work independently of the exhibition. The latter ended in autumn 2014. Precisely because this subject was on the exhibition agenda, the question arose as to how students – in this case a history class from a Weimar high school – could become interested in the topic and its inscriptions in the urban space. When they were asked which locations, individuals, and events are present in the urban space, they answered without hesitation – Weimar Classicism and the former Buchenwald concentration camp. The majority tended to express a greater interest in the concentration camp memorial site, since the events that occurred there seemed of greater relevance to them, to be more topical, and, according to the students, also had a particular commemorative value. As it became clear in the discussions, very few were aware that the era around 1900 is also inscribed in the urban space. Although they knew about the events of the First World War, they were neither familiar with the cultural context of that time nor with Weimar's role in it. The prospect of collecting and preparing the requisite information in an innovative way, in this case, using the Time Window app, was a major motivator for students to participate in the project. They were free to choose the locations for the content, and decided how the information would be conveyed using audio files and images. They could pursue their own lines of interest, incorporating their own preferences and perspectives into the product. In school lessons, smartphones are rarely used productively as information carriers. More often than not, this medium is associated with restrictions excluding it from the learning process. In this project, however, the participants not only used their own smartphones, but also decided which content was going to be provided in a particular form. As a result, the project not only imparted the skills needed to explore history in urban spaces and prepare the relevant materials to do so, it also enhanced the students' media skills. As a widely used device, the smartphone not only offers a simple way of opening up the students' own urban space to them, but also provides a public channel for their findings and analyses. 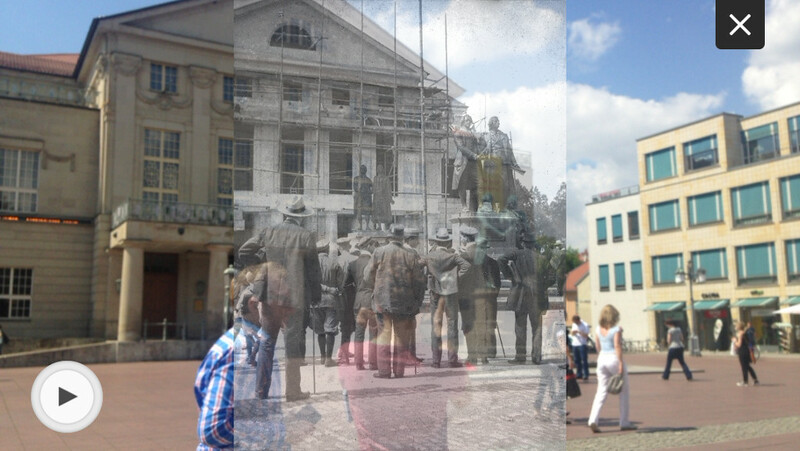 On a mobile map, augmented reality can combine historical photographs with the original locations. The user can navigate through the urban space with the map, and is shown a series of locations where a photograph (a time window) can be called up. When the image is accessed, it links to the camera device in the smartphone. When users then activate the camera function on their smartphones or tablets, the screen turns into a window on the past, with options to play audio guides that fuse past and present. Moreover, the time window's localisation on the map underlines the multiple inscriptions in the urban topography. In this way, augmented reality offered an innovative way to access histories by highlighting the repeated re-inscription of locations, squares, and buildings. The project similarly encouraged students to question and research the authenticity of the images (which were primarily photos). The German National Theatre is the birthplace of German democracy and was the setting for the Nazi seizure of power. With the famous Goethe and Schiller Memorial it is still one of the most popular sights in Weimar. In 1919, the theatre housed the National Assembly, which ratified Germany's first democratic constitution passed into law. In 1933, after the seizure of power, the Nazis removed the plaque designed by Walter Gropius (founder and first director of the Bauhaus) outside the theatre to commemorate the birth of the German constitution. The works of philosopher Friedrich Nietzsche (1844-1900) represented a radical shift in thinking and heralded the dawn of modernist thought. They held out the promise of radically overcoming old ideas and teaching people to think beyond themselves. Even during Nietzsche's lifetime, his sister, Elisabeth Förster-Nietzsche, founded an archive dedicated to her brother's work. She sought to forge a link to Weimar's illustrious past and usher in a new era – a 'New Weimar'. After 1918 the archive was increasingly co-opted by anti-democrats, and by opponents of the new German republic. In 1920, when right-wing forces instigated a nationwide putsch, several people were killed in Weimar. Walter Gropius designed a memorial dedicated to the victims. The monument is one of Germany's first memorials in abstract form. In 1936 it was destroyed by the Nazis, who labelled it an example of 'degenerate art'. Gropius' abstract memorial was reconstructed in 1946. In small groups, the students prepared presentations on the various stops in the tour. The guidelines for the presentations were the questions: 'What happened here? ', 'Why do I find this interesting? ', 'Would it interest others as well? ', and 'How could I make this interesting for others?'. Apart from engaging with the content, the aim was for students to develop their own strategies to make the content accessible and interesting (especially for other students), and thus optimise the experience of history in the topographic space. In a project week at Klassik Stiftung Weimar in July, the small groups spent five days creating text- and audio-based files for the media guide. The results of these sessions are now available for free as a mobile application for iOS and Android from Zeitfenster GbR. 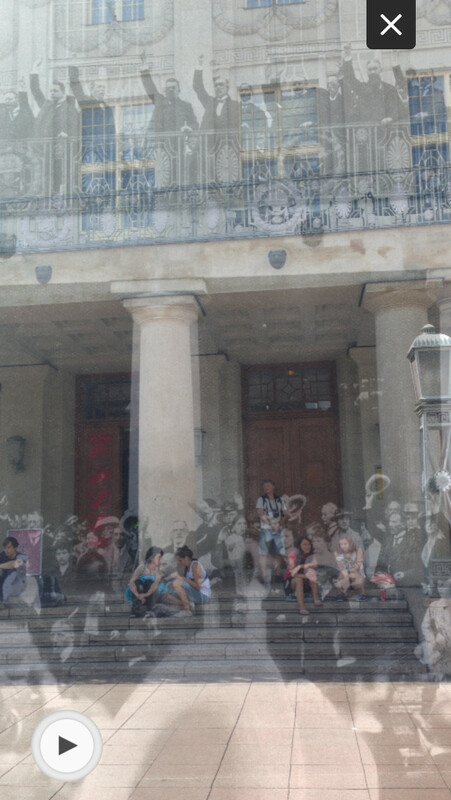 As a supplement to the exhibition, the app provides a new experience of Weimar's diverse sites. Looking to the future, this platform could allow us to include other Weimar locations of ambivalent modern cultural significance. For example the Gauforum built during the Nazi period or Buchenwald concentration camp. One of the challenges in this project was the sourcing of suitable content for the students, given that there was a clear focus on the topic of modernity and, especially, a close link to the exhibition. To help prepare them, the students took part in guided tours of the city and were provided with pre-selected visual content. While students were free to choose their topic themselves, they were still using the information and materials allocated by our team. The project was a pedagogical experiment on how history or historical knowledge can be imparted via maps and how virtual space can be used for aesthetic-cultural education. 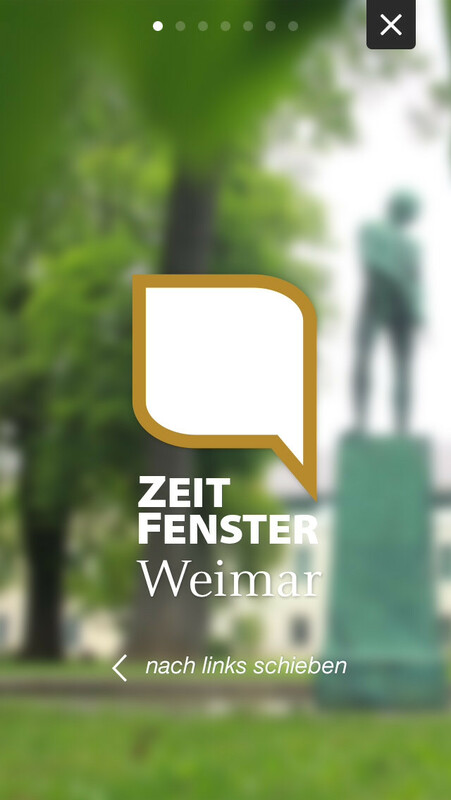 We hope the Zeitfenster-App shows the high potential of cultural mapping and its connection of material and non-material heritage for (historical-political) education. We also hope this project can help to make the age of modernity in Weimar's urban space more visible and people can begin to view the contrast between Weimar as both the birthplace of the doomed democratic republic and a major site for the emergence of the subsequent Nazi regime. Currently, we are developing some pedagogical materials, such as questionnaires, which can be used with the app, for example, by school groups. The educational project was presented by Klassik Stiftung Weimar in cooperation with the German Federal Agency for Civic Education (Bundeszentrale für politische Bildung, bpb). Klassik Stiftung Weimar presides over the UNESCO World Heritage Site 'Classical Weimar', with its numerous historic houses, palaces, parks, and gardens, as well as a historical library and literary archive. The legacy of manuscripts of the great German writer Johann Wolfgang von Goethe, preserved in the Goethe and Schiller Archive, is inscribed as 'documentary heritage' in UNESCO's Memory of the World. Within the Klassik Stiftung Weimar Foundation, one department is dedicated to the task of education. The German Federal Agency for Civic Education strives to foster an understanding of political issues, promote democratic awareness, and encourage citizens to participate in politics. Lisa-Katharina Förster studied Modern German Literature and History of Art at Ludwig-Maximilians-University (LMU) in Munich. From June 2013 until May 2015 she worked at the department of research and educations of Klassik Stiftung Weimar. Dr. Folker Metzger studied History and Science of Education at Pädagogische Hochschule Karlsruhe. 2014 PhD (educ.). Head of Education Department in different Museums (Dresden, Bonn) and since 2007 at the Klassik Stiftung Weimar.